Welcome to the end-of-week update from all of us here at CSE! Tyler here, to tell you that we’ve had a very productive week, as can be seen in the number of highlights in our Top Tenish list! We have some really fun Beta 1 features we’re working on that deserve some extra attention when you check out the Top Tenish list. I’m personally excited about being able to craft and place items like boxes, tables, and doors, as well as siege engines, inside a building plot! Of course this will be a first pass, but it’s something we wanted to get a head start on, as it will inform performance improvements to buildings overall. For any new Backers joining us recently, I’d like to take a step back and explain our update format. You can expect regular updates showcasing the week’s work from the team on both coasts. One of our pledges to you, our Backers, has always been open and honest communication in the production of Camelot Unchained. We also continue to livestream some of the day-to-day work from various members of the team. The schedule for these streams can be found HERE. But wait, there’s more! Each week, we end with a “Wrap-Up” livestream to not only go over the Top Tenish, but also provide some time for live Q&A. If you missed today’s livestream with Mark, you can find that HERE. With all of that said, let’s get into the week’s highlight’s in the form of our Top Tenish list! Testing: We’ve continued lots of testing this week! Thank you all for joining us! We even had two internal tests today on one of our new servers, Nuada Prep, in preparation for testing with our Backers next week. Thank you to everyone who jumped in this week to have some fun and fight the good fight against the vicious bugs! WIP – Design – Taking: Though he was flat on his back and asleep for most of the work week (Mark’s forever-awful back was doing its forever-awful thing), Mark continued work on his Taking game design and progression calculator. A lot of oohs and aahs were heard, but unfortunately, that was just Mark when he tried to sit upright. WIP – Tech – Coherent Integration: George has begun work on integrating Coherent GT into the CU engine. This will replace our current UI framework, an implementation of Chromium Embedded Framework. The switch to Coherent GT will give our engine many benefits, for both our development team as well as for you, the player! On the dev side, we’ll have more direct control over the memory and CPU usage of our UI renderer, plus access to better dev tools for debugging the UI, and much more. For the player, this switch will give better overall UI performance, and will bring many new features that allow more dynamic and interactive interfaces to be developed! This is not a new development for CSE, as we have been planning on making this move for more than a year. Fortunately, right now is the time to make the move, and with George leading the way, we look forward to a fairly smooth integration process. WIP – Tech – Updated Item Tooltips: AJ is wrapping up work on improvements to this first rough pass of item tooltips. This update includes a styling pass, and AJ is in the process of making sure all items show the correct relevant info per type. WIP – Tech – Banes and Boons (Traits): As part of our current sprint, we want to audit the current Banes and Boons and make fixes if necessary. Rob has made a handy-dandy dev UI that allows Ben to assign traits to himself or other players for testing. Tech – New Scenario Format and WIP Capture the Flag Changes: Caleb made changes to the current scenario to allow all players to be on the same team and fight waves of NPCs, for testing and for fun! In the background, he’s working on the messaging system with Andrew, which should land soon. This will allow players to drop the captured flag in the scenario into a receptacle at an owned control point, spawning more NPCs! WIP – Tech – Taking and Building Placed Objects: Earlier today, we ran a successful playtest of updates to taking and crafting. Taking from a node is now a skill, allowing us to trigger an animation and use flyout text to show what players have taken. Christina has also added data sheet support deployment settings on items, which will support placing objects within a building plot. WIP – Building Placed Objects (BPOs): Speaking of which, Matt made a lot of progress on the first pass of end-to-end deploy/placement support for items and siege engines. With assistance from AJ and Christina, we’re very close to having the ability to deploy items and siege engines in specific positions with specific rotations. This will let players begin to customize their defenses and decorations. Further support for placing items in buildings is planned for future sprints. Tech – A.R.C. Support: Matt helped Tim get ARCs working again after all the input & window refactoring that happened in the client a few months back. He also made some supporting refactors to help unify their code with the mainline client, and prevent such significant breaks going forward. This will allow us to continue large-scale battle testing, which I’m sure you all want! Art – Characters 2.0: This week, Jon finished the TDD heavy armor, and completed everything but the materials on the Fall Court armor. He’ll finish that up next Monday! 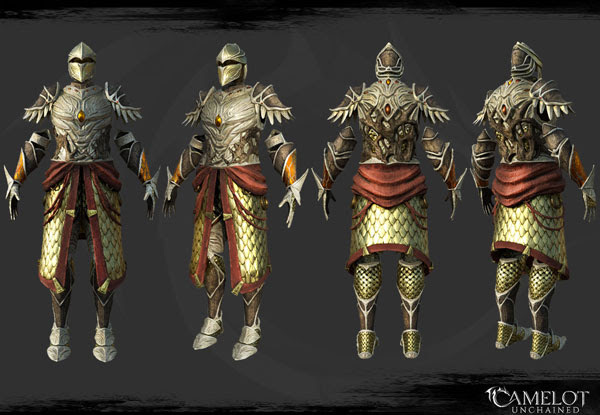 This finishes off our overhaul to improve the visual clarity of the armor with better UV layouts. The next step will be to weight them and use them in the updated character selection screens in the patcher. WIP – Art – Scenario 2 Environment Assets: Dionne and Tyler continued adding assets to this zone, despite a few sick days from Tyler (the spring environment here in Fairfax literally defeated the environment artist)! New ruin assets and ruin rubble. LODs and collision completed on raven, stag, and lion statues. New mossy rock wall assets for forested areas. New first pass cobblestone path material to denote connections between control points. WIP – Collision and LODs on bridge assets to improve performance and gameplay. WIP – Art – VFX 2.0: As we’re doing with the character art, we’re improving the look of VFX based off Michelle’s recently shown concept art, where each faction gets their own unique look per ability type. This week, Mike began developing techniques to create these new looks, starting with the Mjölnir’s abilities. WIP – Art – SFX: This week, dB worked on voice limiting and voice tweaks, trying to get voice limits down to increase audio clarity and performance during large battles. He’s also working on getting an interactive music piece into the game for combat, before starting on new abilities as Mike completes VFX. WIP – Art – New Ability Animations and Class Idles: This week, Sandra finished the Forest Stalker’s new ability animation and began work on the Winter Shadow’s new ability. Scott finished the Empath’s ability animation and class unique idle, and is now working through the secondary animations, such as movement and deflect for the Black Knight. Joe blocked out several poses for the Fianna idle, and began work on the class unique ability. Both of those will be finished up next week so he too can move on to the secondary animations. WIP – Art – Various Concepts: Michelle has finished a second pass on the flag spawn point and flag receptacle models. These will soon be handed off to Jon to create. Additionally, she’s finished a pass on the control point and spawn point bases, also in scenario 2. Towards the end of the week, she began concept work on the new Mjölnir ability, providing direction for Mike’s VFX pass. 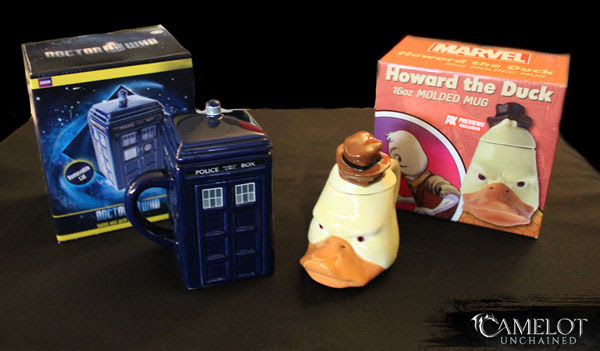 Lots of cool highlights in this week’s Top Tenish! I’m (Tyler) very proud to be working with such a talented and clearly hard-working group of folks! For art this week, we start off with a static image of Scott’s WIP of the Empath’s new ability, Agonizing Embrace. Our new abilities are a bit more dramatic with more VFX, so it may make more sense with the current description, “The Empath holds his head in his hands and writhes in agony as distortion ripples around him, restoring him and all nearby allies to full health, blood, and stamina. Nearby enemies take damage and are afflicted with disorient.” We’ll have an animation for you next week, but for now, you can see the frames go from idle to prepare, which leads into a crouched hold, from which his aoe “explodes” outward, and back to idle. Scott has some great animation on the shaking fists I particularly loved in this work. Mike will have his work cut out for him when he works on the VFX! 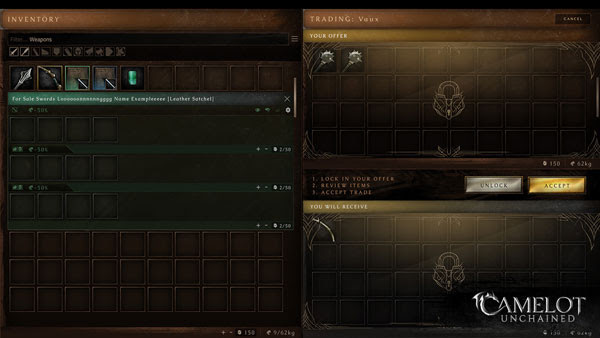 Next up, we have the updated styling on the trade window interface from James. As mentioned above, Jon completed the update to the TDD heavy armor. You can catch his livestream HERE. Much shiny! Michelle has been very busy, as is almost always the case. 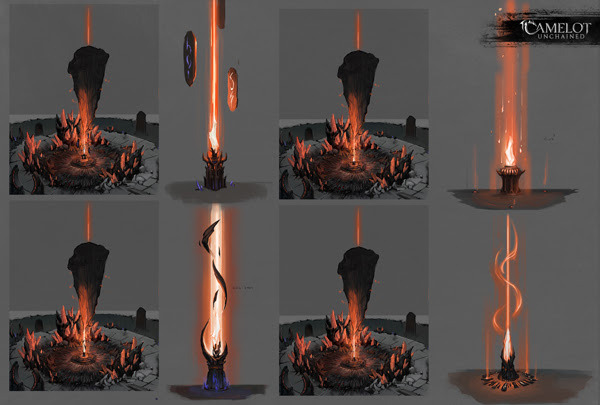 First up, we have various ideas for the pedestal at the center of the map, from which our “flag” item will spawn. 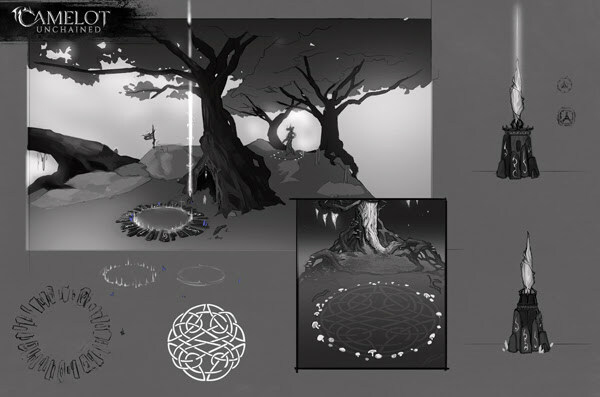 And next, we have two images encompassing different ideas for the control point dais and the accompanying “flag” receptacle that players will place the “flag” into. As you can see in these concepts, our “flag” may turn out to be a crystal, hence all the parentheses. Special thanks this week to Ludovic, who sent us these awesome new mugs to add a bit of color to the office mug collection. Thank you very much, sir! We also have a special announcement this week! 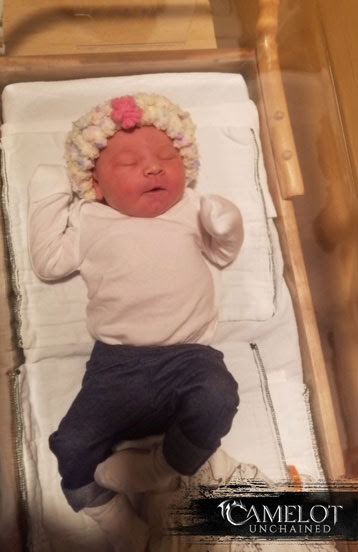 Colin and his wife Krista welcomed a healthy baby girl into the world on April 2nd! We’re all waiting for her to join the team in eighteen years! Congratulations from all of us at CSE!